I work for the free software world and among others, I develop applications for web database access using tools such as PostGreSQL ,MySQL et PHP. To keep some freedom in my way of working (to be able to do another job from time to time... like starting a new C project) I recently started to set up my own business. To make things worse, I am -still- an ABUL member www.abul.org (and I have not yet paid my subscription!). I will try to explain here the work we have done for implementing a linux-samba server used as a domain controller for a Windows network. Users permissions management, profiles... will be detailed. This document relies on Debian GNU/Linux 2.2 what may explain that your default smb.conf file can be slightly different according to your distro. Let's suppose you know a little bit about samba and that it is already installed on your server. Samba uses an unique configuration file in which you can find blocks such as [global]. Only one configuration file for samba! If you run samba with this configuration file, the windows machines on your local network will be able to see, in their network neighborhood, that a machine called (your linux box name) shares a temp directory in which you are allowed to write. You can specify the netbios name of your samba server. You can see the netbios name in the network neighborhood from your windows machines. If you don't give any, the linux server will get its network name as its netbios name. List of users with no access to samba. For example "root" should not be allowed. If your linux server has more than one network card and you want to restrict its activity to only one network. Selection of the security mode to be used. Using security=user requires each user to have an account on the GNU/Linux server. If you don't want samba to manage the users and to share the same resource for everyone, you can select security=share. Name of the workgroup your linux server must be part of. A description for your Linux box (some string). A list of options to "tune" samba and make it faster, for instance. Must you use encrypted passwords? It is important to know that every windows system (almost) use a different scheme! Is your Linux server working as a wins server? OS level to know which one will be "elected" domain master , local master, etc. Must Samba to be "preferred" among other servers if there are some? Must Samba manage connection control for the whole domain? Which script to run for this user when opening a session? Where are the startup script files? Where to store the users profiles? What is the resource order to follow to find the name of a machine in the network? Must the samba server also be used as a DNS proxy? To keep the filenames case. Must unix and windows passwords be synchronized? Which program to use for password changes. What is the chat "protocol" to change the password? We specify where the netlogon is. Example using these variables: if your network hosts machines running windows 3.11 and windows 98, you can create two configuration files, one for each system, using the %a variable. ; This server also works as a WINS server. ; as soon as the gateway is active. ; "higher" than the NT server, if there is one! ; Which script to run when a client connects? ; In which directory can we find the startup script files? ; Where to store the users profiles? ; the name of a machine? ; sending broadcast on a regular basis. ; Must Samba be used as a DNS proxy? ; Must we synchronize windows and linux passwords? ; the machines time a bit. ; We specify where the netlogon is. ; thus we don't need to make it public. ; He can write, can't he! ; mask is set to 700 as well! ; for a user needing much space! a CONFIG.POL file for system security strategy (in this directory too). To create the config.pol file, search for poledit.exe found in the windows CD. This file allows to automatically mount the user's personal directory on startup as P: and the temporary directory as T:. The system time is also got from the samba server. NOTE: the .bat file line feeds must be in "DOS mode". 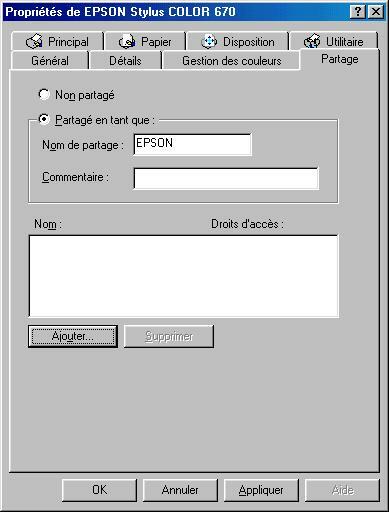 The easiest way is to create this file with the notepad, for instance, and then send it to the server. 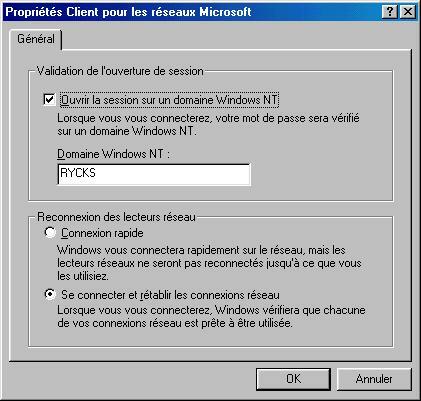 Securing Windows, is almost possible, using a domain controller. That's a title! Well, I borrowed it from a MS doc concerning their system policy tool. Thus, to create a Windows system policy, for example to prevent some users (all ?) from running regedit, a DOS program, etc, you have to use POLEDIT found in the Windows 98 CD. Run PolEdit, watch its help, write down the information... this article is not intended to teach you how proprietary software works. Once your .POL file is ready, copy it to your samba server, into the directory found in the [netlogon] group PATH. NOTE: PolEdit allows to create users groups and users, but we haven't succeeded yet. Only the default user is taken into account. Nevertheless, create an user "erics" in poledit... and it works. With a bit of luck, 20 mouse clicks and a reboot should be enough to configure windows! Next click on the "Identification" tab and provide the computer name and the corresponding workgroup. 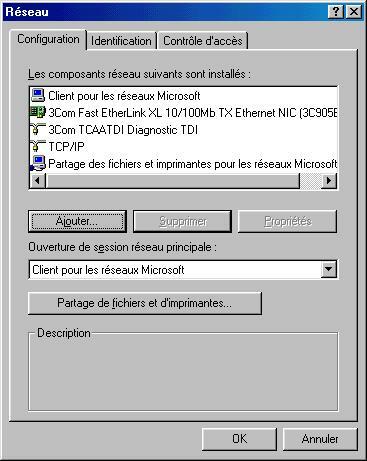 Go back to the configuration tab and double-click on "Client for MS network"
At work, a bottleneck quickly appears because of the use of windows profiles. As a matter of fact, the profile is full of stuff MS decided to be important, such as IE cache, OutLook cache, etc. In short, this means that about 10 MB will be downloaded when connecting to a machine (however, my profile is a "classical" one, a background image, ie ans outlook...) and 10 MB will be uploaded to the server when disconnecting. 10 MB for each user, in a 15 machines room ("normal" size of a lab, for instance), makes 150 MB, and if the building holds 10 rooms... just calculate the users disconnecting time when the bell rings. You then should anticipate and log out at to 5... (well, I must admit that is what I was doing when I was a student)... rather than at past 5. It's a bit like the big cities traffic jam: better to go either 10 minutes before or 2 hours after! So, according to the policy you implement, it could be a good idea to mount the home directory to P: (for example, P as Personal) for everyone and teach the users: "save your documents into P and not in "My documents", otherwise you won't get them back". Next, you have to find the software able to be configured to have its bookmarks in P:\bookmarks.html and so on for the parameters. I don't even know if this exists in the windows world! If you are aware of a solution, write an article from it, this is a knowledge to share! Is it possible to have various workgroups on the same domain, how can this be managed, is it possible to share the problems between various GNU/Linux Samba? How to use both NT and Samba servers? NT clients configuration: the equivalent of CONFIG.POL has another name under NT. HOT NEWS: someone gave me the solution. Enough to select "resource level access control" during step 3 of the windows configuration. JohnPerr for urging me to write my first article for LinuxFocus, and to have translated it to English. Etienne, Éric, and the invisible man I forgot the name, sorry for that! Then, thank you to have shared your knowledge from MS courses about NT servers. Jean Peyratout, do we need to say why? It would be much too long. Rycks to provide me with time and resources to develop and document free software.